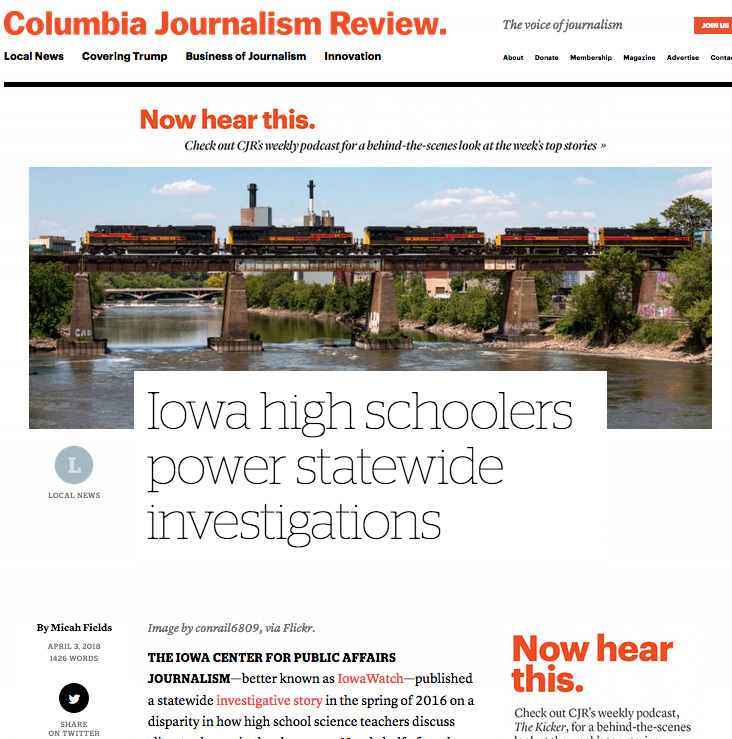 Columbia Journalism Review had good things to say in April 2018 about work IowaWatch does with high school journalists. A link to the report is below, in this story. IowaWatch, part of the Iowa Center for Public Affairs Journalism, has received two significant grants for general operating expenses, with a matching challenge attached to one. The Reva and David Logan Foundation awarded IowaWatch a grant of $20,000 and also supplemented that with a challenge grant of $10,000 more if IowaWatch matches that amount in new funding. IowaWatch is seeking match partners for the challenge. This marks the second time the Iowa City-based non-profit, non-partisan IowaWatch has received a grant from the Chicago-based foundation. Craig Newmark Philanthropies also has awarded IowaWatch a grant, for $10,000. That San Francisco-based organization is the vessel through which Newmark, founder of Craigslist Inc., donates money for four specific causes — trustworthy journalism, veterans and families, women in technology and voter protection. The Iowa center produces investigative and public affairs journalism in collaboration with other Iowa newsrooms and works one-on-one with college students, and sometimes high school students, who want to produce this kind of journalism at a professional, ethical level. This past year, its work with high school journalists was recognized in a Columbia Journalism Review story and its work in as a statewide news source was noted in a Time magazine story. The Iowa center operates a news website, IowaWatch.org, and radio program, the IowaWatch Connection, and distributes its news stories to media outlets in Iowa for newspaper republication or broadcast airing. The grant awards this summer follow IowaWatch receiving at the beginning of this year a grant from the Fund for Nonprofit News at The Miami Foundation. That $19,020 grant, part of the nationwide News Match fund drive, matched eligible donations individuals made to IowaWatch at the end of 2017. IowaWatch is eligible again for News Match funding, for donations made in November and December 2018. The News Match drive is funded by Democracy Fund, the John S. and James L. Knight Foundation, the John D. and Catherine T. MacArthur Foundation, the Ethics and Excellence in Journalism Foundation and Facebook. IowaWatch also has received this year operating grants from The Gazette Co. and Woodward Communications and receives financial support from a University of Northern Iowa Science in the Media contract, which supported a spring reporting project with student journalists at Cedar Falls High School. IowaWatch is an independent, 501(c)(3) non-profit program. It is a member of the Institute for Nonprofit News and participates with the Local Independent Online News publishers. Find out more at IowaWatch.org/.